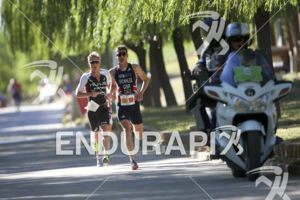 Henri Schoeman, Jonny Brownlee and Kristian Blummenfelt leading a front pack on the run course at the 2018 Beijing International Triathlon on September 23, 2018 in Beijing, China. Sign up and login for more access with EnduraPix. View larger images, save images to your lightbox, and license images for your needs. © 2019 Extreme Team LLC. All Rights Reserved. Unauthorized use of any image without an appropriate license is hereby prohibited.